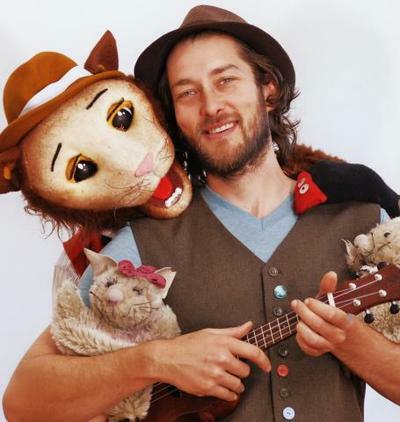 Woody Clark, the musician behind kids entertainment band Woody's World, shares some of his life inspirations, stories and general endeavours with you, the readers of KidTown Melbourne. Q:How would you describe Woody's World's style of music, for those unfamiliar with your work? Woody's World’s music is fun and accessible. We make it for both kids and parents because we think of it as family music which has something for all ages. Our music is playful at heart and engages kids imagination through a strong sense of narrative, telling stories about family life, adventure and nature and showing kids that life is actually rather magical. Q:Why do you think music is important for children? Every child should be exposed to music on a regular basis and have the opportunity to learn an instrument. Live performance is a brilliant way to initiate an interest in music within young children. A musician or a songwriter is very much like being a painter or an actor, as they all share and interpret life’s experiences through their chosen art form. Creating and enjoying music is a part of what makes us human. Q:Your own children, who appear on your album Woody's World - Good Morning Kids, and also tour with you, are obviously very musical. When did they start learning to play musical instruments? My three kids were exposed to live music from a very young age (the womb in fact), so playing music has become “normalised” for them. It’s just part of what happens in our home. They learned string instruments at school from aged 9 and I worked to encourage this and initiated little jam sessions to begin to improvise. My advice to parents is to make your child’s musical experience fun, engaging and relevant. That way music can be a language they can learn to speak. Q: What instruments do your children play now? Tali plays violin to a good standard now and continues to learn from a great teacher on a weekly basis. She also plays ukulele and guitar which I teach informally. Safin is also proficient with his cello and he plays recorder in our live shows. Jayda continues to learn viola and likes to sing a lot. She was a great co-songwriter on the GMK album. Not a bad team I must say! Q: Do you see your children following your own footsteps and venturing into the music industry? I think my youngest daughter Jayda may be the one to continue on the stage as she is the most natural and interested in performing. The other two may dip in and out of music but pursue other things. As a parent, all I ask is that they have had a great experience in the world of music, appreciating it, making it and expressing it. We often buy CD’s at festivals and listen to the songwriting, arrangements and production on the album. This is all part of their education. Q:You are running a Pozible campaign to produce your second album, which we think is a fabulous idea. Do you think crowd funding campaigns is the way of the future for performing artists and creative folk? Yes, crowdfunding is a great way to “pre-raise” revenue and has a secondary effect of promoting the project. I have friends who have reached their target twice over with an inspiring video and great rewards on offer. Fans are keen to support independent artists and pre order a CD. My campaign has just a few days left and we are almost there so spread the word!!! We are raising funds to record our second album “The Family Band”. This will feature songs written and recorded by three generations of our family and inspire other families to make music rather than consume it. Q:As well as performing live to family audiences, and producing musical albums, we understand you are a teacher. You are obviously very busy! What do you do to 'switch off' and relax? Yes, life is busy! When I’m not on tour, working on Woody’s World admin or on school camp, I like to relax by walking in nature, strumming my guitar or working on the house renovations (though they haven’t progressed much in the last twelve months). I also coach my twins’ soccer team which has been very rewarding and a nice change from my other commitments. Last year we won the league and Safin won best and fairest for under 13’s. Q: Who is your musical inspiration? Do you have a favourite band or performing artist? My dad has been the biggest influence. He used to tour around Australia and something the whole family would go tag along. I have fond memories of school tours to remote places and festivals. When I was about 22, I went through his albums and learned the songs I liked. Hercules the Alley Cat was one such song that has stayed with me – it was my favourite song as a child and now I have performed it to thousands of kids. I have had particular bands or artists that have influenced me over the years. My first cassette I received at age 9 was the Beatles, and the following year Bruce Springsteen. I played these albums until they were warped and twisted and the songs were barely audible. I particularly love John Lennon who is a true artist; Bruce is a great story teller too. Other artists I have listened to intensely for periods include Ben Harper, Led Zeplin, Cat Stevens, Tracy Chapman and the Chillie Peppers. There are some great local acts I have met at festivals. Loren Kate is one such folk singer-songwriter who is emerging on the scene. Q: If we were to go back and ask the 8yr old Woody "What do you want to be when you grow up? ", what would you say? Most likely he would have wanted to be a sportsman. The young Woody love anything to do with hitting, kicking or throwing a ball and would do it for hours at a time. Q: You are performing at the Melbourne Recital Centre on Saturday 16 January 2016. The KidTown Melbourne crew are very excited! What can we expect from your show? We are bringing our Big Show – THE GOOD MORNING KIDS SHOW - to the MRC. This means we have Hercules the Alley Cat, and Hue Blanes (Jazz musician extraordinaire). Tali Safin and Jayda will be there too! Families can expect to sing, dance, and laugh with snake handling guaranteed! We can’t wait to bring the Good Morning Kids Show to MRC! Q:Is this the first time you've performed at the Melbourne Recital Centre? This is our first performance at MRC and these are exciting times. It’s nice to be valued and included along with some amazing performers and children’s musicians. We have a brilliant show that has come from an equally wonderful album and those who haven’t heard of Woody’s World and seen our show are going to get a very nice surprise.